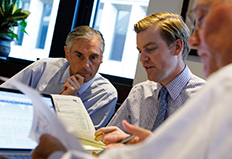 Our investment professionals work with individuals, trusts, foundations, institutions, and retirement accounts. We believe that successful asset management results from our collective personal experience gathered over numerous market cycles, in-depth analysis of the current markets, and a thorough understanding of the financial needs of our clients. Please review this Important Disclosure Information. Your experience with us is different from the start.